With 83.9% of the UK population expected to access the internet in 2018, digital content consumption continues to grow steadily. Some of the most popular digital activities include video viewing, social networking and listening to audio content, each of which will be performed by the majority of the UK population this year. Most further growth in total UK internet usage will be driven by younger and older generations, many of whom will be going online for the first time. These new internet users are likely to access the web via mobile devices. UK smartphone usage will reach a milestone in 2020, when two-thirds of the population will use one at least once per month. 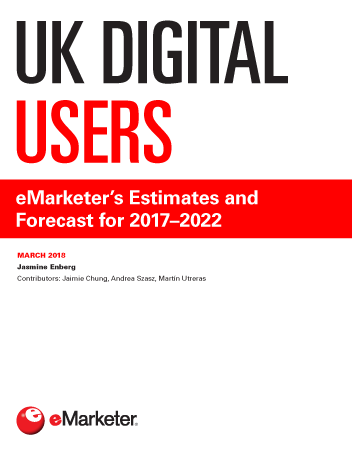 Roughly half (50.7%) of UK tablet users will use an iPad in 2018—this figure is expected to remain relatively stable through 2022. Facebook will remain the most popular social network throughout the forecast period, used by more than eight in 10 social network users. Nevertheless, as more UK internet users sign up for alternative social platforms, particularly Instagram, Facebook user penetration among total social network users will fall. Music streaming services such as Spotify have helped grow the number of digital audio listeners in the UK, particularly on mobile. eMarketer estimates 35.1 million people will listen to audio content digitally in 2018, and 60.1% of them will do so via mobile phone. "Over 80% of the UK population will use the internet in 2018. More than two-thirds will watch digital video regularly, while at least half will use a social network or listen to audio content digitally."